Labrador Retriever Temperament and Behavior: What To Expect? Because the Labrador Retriever temperament is so cheerful and outgoing, he remains one of the most popular breeds of dog in the world – a position belonging to him for many years. However, this does not necessarily mean he is the perfect dog for all circumstances. The ancestors of this breed first appeared in Canada, but the modern Labrador Retriever developed in England during the 19th century. Hunters used Labs to retrieve the ducks they shot. 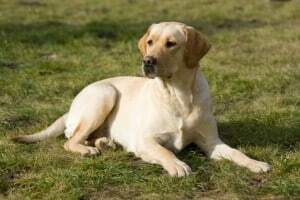 Labs are an athletic breed, which means they need to work, else they can become difficult to manage. The Labrador Retriever temperament is best suited for an active person who is willing to exercise their dog both physically and mentally. If your idea of a pleasant afternoon is curling up with a good book, then I’d recommend you not to choose a Lab for your canine companion. Otherwise, your dog will become bored, and that’s when behavior problems start to appear. The Labrador Retriever is, first and foremost, a working dog. Some breeders breed dogs not for looks but for work, and the Lab is one of those dogs. You need to give your Lab the opportunity to use his considerable intelligence for good, or he will instead use it for mischief. For instance, a bored Lab will dig, bark and pull the wash off the line – all of those boredom-related behaviors we dislike so much. This type of dog temperament is ideally suited for dog obedience and agility training. Your Lab will not only enjoy the sport, but he will also enjoy working with you as part of your team. A Lab needs a competent trainer who is a firm, consistent leader. I don’t recommend the Lab to a novice dog owner. I prefer to see them in a home with someone who has owned dogs before. You may be able to find some retrieving trials near where you live. This is ideal for your dog because it gives him the opportunity to do what he does best. I’ve found that the physical and mental effort this type of work requires leaves your dog happily tired-out for quite some time after. As with other working dog temperaments, the Labrador can be extremely focused on whatever catches his attention. He will follow a scent until he finds its source, which can encourage him to escape from his yard to continue the hunt. The Labrador’s original job was to go out into the field and bring back the downed bird the hunter shot in his mouth. Today, Labs still enjoy using their mouths to carry things around or to chew. Chewing is bad but common behavior for a Labrador who doesn’t get much physical exercise. You may find that your Lab also likes to chew lightly on your hands. Fortunately, this doesn't usually hurt, but it’s still not a behavior you want to encourage. The best way to manage this behavior is to give your dog plenty of chew toys to gnaw on. Some examples are stuffed Kongs or nylon Denta-bones. If he starts to mouth your hand, turn his attention to something he will like better, like the Denta-bone. You can also take him for a run every day to keep his energy levels under control. One of the best-known characteristics of this dog’s temperament is his love of food. (A dog after my own heart!) Labradors will eat just about anything, and plenty of it. This means that they are likely to gain excess weight. Ultimately, you're the one who controls how much your dog eats. It may be difficult, but don’t give in to those pleading brown eyes. Feed him just enough to keep him lean, and he won’t fall victim to obesity-related diseases like arthritis or diabetes. 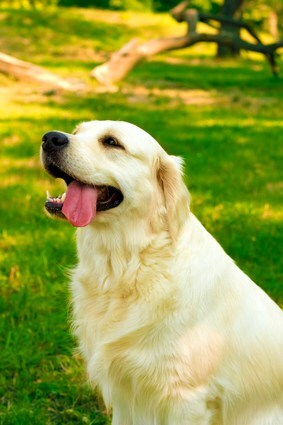 Not only that but if you avoid excess weight gain, your Lab can live up to two years longer than if he was overweight. It isn't always easy to identify the right dog temperaments for your lifestyle, but it's easy to see the type of home that best suits this breed. The happy and outgoing Labrador Retriever temperament is the ideal canine companion if you are an active person or family, and he will love to share all your outdoor adventures. The Lab is a strong dog, and he also has a high energy level, so early socialization and obedience training is a must. While it’s cute when they’re little, you definitely don’t want an adult Lab vigorously jumping up on you. If you find you are having difficulty training your Lab puppy, then enroll him in obedience classes – it’s that important. Not only do obedience classes mold him into the dog he should grow up to be, but it also gives him the chance to socialize with other dogs, so, two birds with one stone! For help with training your Labrador Retreiever you should take a look at The Online Dog Trainer by Doggy Dan. Doggy Dan is an expert Dog Trainer based in New Zealand. His online resource contains Hundreds of Excellent Dog Training Videos that will take you step-by-step through the process of developing a healthy, happy well-behaved dog. The Lab has a thick double coat which is also water-resistant. Brush him weekly to keep him looking his best. Give them the occasional bath to keep him looking shiny and neat and smelling clean, and don’t forget to regularly trim his nails to prevent discomfort while walking. There are three main Labrador Retriever colors, and because this breed is so common, you’ve probably seen them all at some point in your life. They come in yellow, chocolate, or black. Because the agile Labrador Retriever temperament comes with a bundle of energy, you need to give him daily exercise. If you don’t give him an outlet to release it, he will put that energy into destructive behavior, like chewing or jumping. In fact, Labs thrive on the kind of hard work that pulls the marrow from your bones. That’s why Labs excel in K-9 roles involving search-and-rescue missions or drug or bomb detection. Two of the things a Lab loves most are retrieving (hence the name) and swimming. If you can combine some kind of water activity with his daily exercise, you will have one happy Lab on your hands. He also enjoys participating in hunting or canine sports. You may be wondering what the difference is between a Labrador Retriever and a Golden Retriever. For one thing, you can see it right in the coat: the Lab has a short coat, while the Golden’s coat is, well, golden and flowing. For another, the Golden Retriever hails from Scotland, while the Labrador comes from the Canadian territory of Newfoundland and Labrador. As far as temperaments go, though, the Golden Retriever has the edge over the Lab, if only for his stunning intelligence, quiet demeanor, and supreme docility. This is not to say the Lab is aggressive by any means. But, if there’s a rowdy child in the room, the Golden will have more patience for it than the Lab. The Labrador Retriever's life expectancy is between 10 and 14 years. The average healthy weight for a Labrador Retriever is between 55 and 71 lbs. for a female, and between 64 and 79 lbs. for a male. As for height, the average height of a Lab is between 22 and 24 inches tall. It’s up to you really. You can either buy a Labrador Retriever for sale from a breeder or adopt one at your local animal shelter. The good news is that Labs are common, so you will have much better luck trying to find a Lab at the shelter than, say, a Shar-Pei. Because Labrador Retrievers are not a rare breed, the average Labrador Retriever price is between $300 and $1,000 if you choose to go through a breeder. In a world where some dogs cost as much as $6,000 (or more), $300 is practically unheard of, making the Lab one of the more affordable dogs out there. At that price, whether to buy or adopt is less a matter of expense and more a matter of preference. Adopting a Labrador Retriever puppy should be fairly painless. You may not have to wait long at all to find a Lab at your local shelter or adoption center. You may be thinking to yourself, at $300 from a breeder, why would I want to adopt an older dog for the same price and who probably had a rough history? For one thing, adopting a dog gets him out of the shelter. That’s one less dog the shelter has to find a home for, and one more dog they can help when the space frees up. For another, when you adopt you get to enjoy the benefit of bypassing all the annoying puppy stuff. You don’t have to train him not to chew your slippers, or to do his business outside. 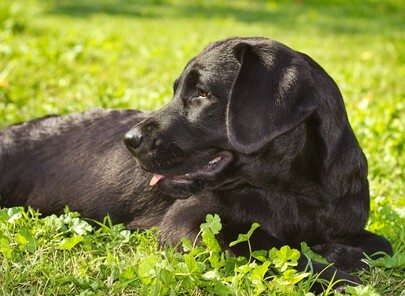 If you are in the market for a Labrador Retriever breeder, try the main page for The Labrador Retriever Club of America. This site is a good place to start if you’re unsure where to find a list of reputable breeders in your local area. Once you pick a breeder, be sure to do your research, both before and during your visit. Check the breeder out online to see if there’s any negative press. And when you get to the house, use your intuition. If something feels off, it may just be off. Look for obvious signs that the breeder isn’t taking good care of the dogs like their living quarters is dirty or unsafe. Make sure the breeder has all the health paperwork for the dog you’re interested in bringing home. A good breeder, like a good adoption agency, will do everything possible to make sure her dogs don’t come back. The healthier her pups, and the happier you are, the more likely she’s about to make a sale that will result in one of her pups getting a warm and loving home. And the more likely you will be to bring home your new best friend. Conclusion: Why the Labrador Retriever? The happy and outgoing Labrador Retriever temperament makes him an ideal canine companion for an active person or family. He will jump at the chance (but not really, if you train him well) to share in all of your outdoor adventures. Previous post: How to Best Manage the Greyhound Temperament?